- Configure Subsonic to authenticate on LDAP. - Login as an LDAP user. - On the login page, ONLY type the username, leave the password field blank and then press enter on your keyboard. - Once the page refreshes, you can see the message: "Wrong username or password." doesn't show up. Try to login with the username and password back and you won't be able. It seems like this breaks the authentication mechanisms. Thanks in advance for looking onto this problem. Thank you soooo much for this update! The disappearing data issues seem to be fixed. After a full re-scan following the update I did some extensive file changing and moving today, everything showed as it should even without additional scans. I was about to jump ship so thank you for fixing this painful problem. one of the things I have done is remove openjdk 7 and install openjdk 8 it might help ..
[2017-11-14 15:37:24,686] INFO MediaScannerService - Scanned media library with 123750 entries. [2017-11-14 17:11:59,064] INFO MediaScannerService - Scanned media library with 159553 entries. [2017-11-14 17:11:59,064] INFO MediaScannerService - Marking non-present files. [2017-11-14 17:12:24,078] INFO MediaScannerService - Marking non-present artists. [2017-11-14 17:12:25,093] INFO MediaScannerService - Marking non-present albums. [2017-11-14 17:12:28,072] INFO MediaScannerService - Completed media library scan. maybe not in the upper folders . .
when in shell can you access it? user / group / rights? Problem is that Podcasts setting are not working. The correct path is /music/Podcast. There are no directory mentioned in error. It’s like there is hardcoded /mnt/media somewhere. sindre_mehus wrote: Bugfix: Externally modified tracks disappear in Subsonic. I upgraded for this fix, from 6.1.1. I had an album with some (but not all) flac files with invalid DATE tags. I fixed the tags with an external tagger and rescanned. The retagged files disappeared from the Subsonic web ui, but the files that were not changed remained. I then upgraded to 6.1.3 and rescanned. The flac files that had disappeared came back, however the tags appeared as they did before I did anything at all. So the issue is not fully resolved yet. I haven't been able to find a workaround. 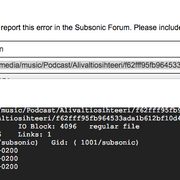 A couple days ago (after updating to newest subsonic version 6.1.3), I realized that I could no longer play songs. The play buttons disappeared, and I couldn't find the settings for Subsonic in my web browser. In an act of desperation I deleted all of my local settings files and created a new user on Subsonic (still on version 6.1.3). Seemed to work, but the next day, I once again could not use the settings in the Web UI, and the play/queue controls were gone. I have now repeated this process of removing my local settings files, setting up a new user, but also downgraded to 6.1.2. I did this yesterday, and today I am no longer having the issue. "Bugfix: Hide links, buttons etc in the web interface if a user is not allowed to play music." Is causing issues with users, even when they are granted the proper permissions. I was sure to give my custom user ALL Subsonic privileges, including admin rights, and yet the settings and play controls were still gone the next day. antti wrote: Problem is that Podcasts setting are not working. The correct path is /music/Podcast. There are no directory mentioned in error. It’s like there is hardcoded /mnt/media somewhere. Still Podcast are not working. Error message gives strange path that doesn't exist nor have ever existed. I have tried to link /mnt/ to right place but that didn't help. Where information about podcasts is located?